The Beginning of Inflation Tracking in the U.S. Contrary to popular belief the U.S. didn’t begin tracking inflation in 1913. Inflation tracking actually began in 1917 but once the index was constructed inflation rates and the Consumer Price Index for the prior years were reconstructed back to 1913 from price data available at the time. In 1917 the U.S. joined World War I and one of the prime motivators for developing the CPI was rapidly rising prices due to the war effort. The government was pumping money into the shipping centers and the workers were demanding cost-of-living adjustments for wages. Total cumulative inflation for the period of 1913 through 1919 was an astronomical 97.96%. For more information on the conditions during this period see Inflation and CPI Consumer Price Index 1913-1919. The 1920’s was a period of economic recovery from the devastation of WWI but the decade began with deflation as prices began contracting. 1920 saw a deflationary -1.55%. 1921 saw prices decline -11.05% and by 1922 prices were basically flat losing only -0.59%. We talk about the difference between the rich and the poor today but the 1920’s had much more poverty than the term “roaring 20’s” would suggest. Over 50% of Americans lived on farms and the decade was rough on farmers. During the previous decade farmers had boosted production and gone into debt to buy tractors in an effort to feed war torn Europe. But when the war ended there was massive surpluses and prices fell drastically, farmers went bankrupt but the stock market boomed so the “city cousin” prospered while the “country cousin” suffered. 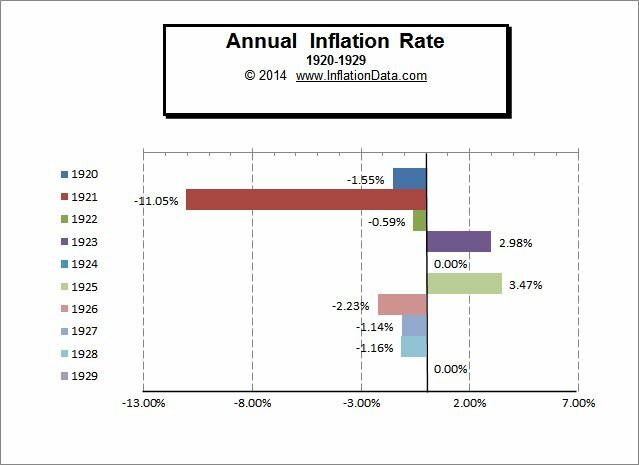 For more information see Inflation and CPI Consumer Price Index 1920-1929. The massive speculation of the 1920’s came to an abrupt halt with the stock market crash in September of 1929. This led to a market panic and a liquidity crisis as banks refused to take any further risk and lending dried up. Although the stock market recovered some of its losses in 1930 some economists believe that government tight money policies prolonged the depression, although Austrian economists hold that the FED’s expansion of the money supply in the 1920s is what led to an unsustainable credit-driven boom in the first place. The first three years of the 1930’s are marked by deflation while the next five years were moderately inflationary and 1938-39 were mildly deflationary again as the economy slipped back toward depression. See Inflation and CPI 1930-1939. The 1940’s began with Europe engulfed in war, Germany invaded her neighbors as did Russia and Japan until Germany and Russia finally faced each other in June of 1941. When Japan attacked Pearl Harbor the U.S. was finally drawn into the war. In many areas of the world inflation was rampant as countries printed money to finance the war effort. The Philippines, Greece, Hungary and China each had their own hyperinflation during the decade. 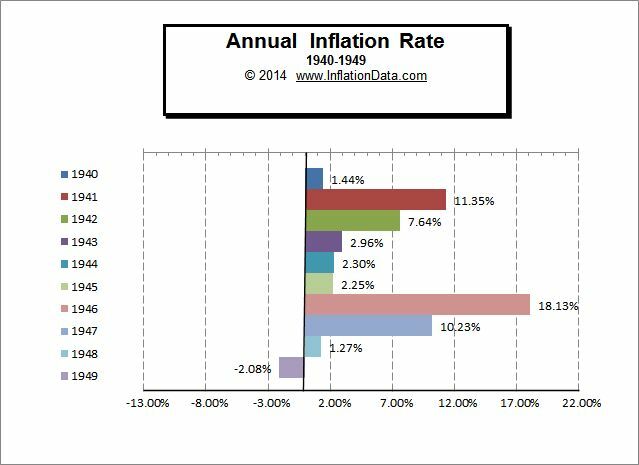 The United States began the decade in deflation but by the end of 1941 annual inflation was in the double digits. By the middle of 1943 inflation rates began falling and 1944-1945 had low inflation rates. But by the middle of 1946 inflation was heating up to double digits again and by the beginning of 1947 it was nearing 20%. Inflation began falling mid-1947 and by mid-1949 prices had stopped rising and were actually falling. See Inflation and CPI 1940-1949. Unfortunately the 50’s were not all hot rods and bobby socks, the world was engulfed in a variety of “wars by proxy” as the proponents on both sides financed small wars in remote locations. The war in Korea lasted from 1950-53 and the Vietnam war began in 1959. In between was the Suez war in 1956, Algeria 1954-62, and the Cuban Revolution 1953-59. Technology was booming as plastics and televisions proliferated, polio vaccines were invented along with semiconductors and solar cells. Inflation was moderate for most of the decade with the exception of 1950 when it topped 8%. See Inflation and CPI 1950-1959 for more information about this decade.